作者: The AsiaN Editor on 26 November , 2013. Anti-government protesters in Thailand vowed Tuesday to take control of state offices nationwide in their bid to oust Prime Minister Yingluck Shinawatra, escalating the biggest challenge she has faced since taking office. Opposition-led protesters camped out overnight at the Finance and Foreign Ministries after storming their gates during a chaotic day of street rallies Monday. Both were closed Tuesday, along with the Agriculture Ministry, which told employees not to come to work to avoid nearby street protests in Bangkok. Protesters say they want Yingluck, who took office in 2011, to step down amid claims her government is controlled by her brother, former Prime Minister Thaksin Shinawatra, who was ousted in a military coup in 2006 for alleged corruption. 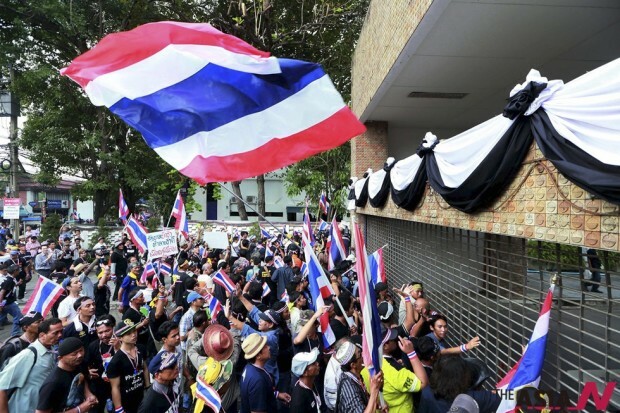 The occupation of the ministry offices has raised fears of violence and worries that Thailand is entering a new chapter of political instability. 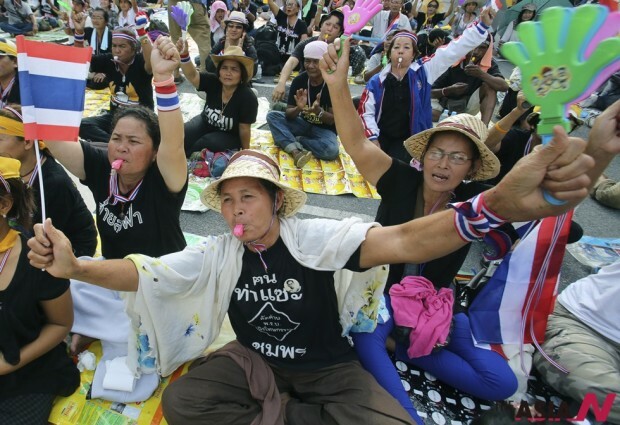 They also recall previous protests against Thaksin and his allies in 2008, when protesters occupied and shut down the prime minister’s office for three months. Separately on Tuesday, the opposition Democrat Party, which is spearheading the protests, launched a parliamentary no-confidence debate against Yingluck. The vote has no chance of unseating Yingluck as her ruling Pheu Thai party controls the House of Representatives. Yingluck called for calm and offered to negotiate with protest leaders. “If we can talk, I believe the country will return to normal,” she said. Yingluck has vowed not to use violence to stop the protests but expanded special security laws to cover the entire capital late Monday. The Internal Security Act was already in place for three districts of Bangkok since August, when there were early signs of political unrest. It authorizes officials to impose curfews, seal off roads, restrict access to buildings and ban the use of electronic devices in designated areas. The anti-government campaign started last month after the ruling party tried to pass a controversial law that critics said was designed to absolve Thaksin and others of politically related offenses. The Senate rejected the bill in a bid to end the protests, but the rallies have gained momentum. Tension built on Sunday when more than 100,000 people joined an anti-government march in the capital. 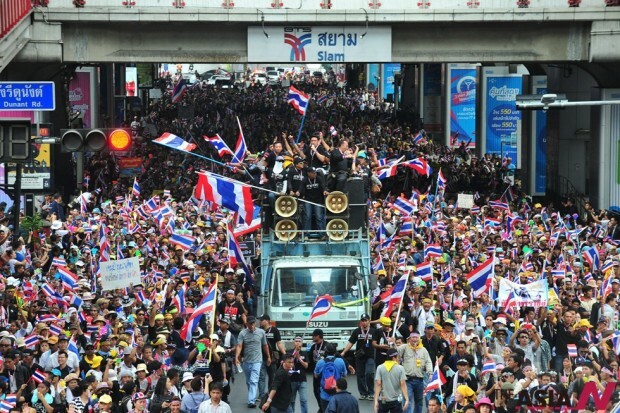 Many fear that clashes could erupt between the anti-government protesters and Thaksin’s supporters, who are staging their own rally at a Bangkok stadium and have vowed to stay until the opposition calls off its demonstrations. Thaksin’s supporters and opponents have battled for power since he was toppled in 2006 following street protests accusing him of corruption and disrespect for the country’s constitutional monarch, King Bhumibol Adulyadej. Thaksin has lived in self-imposed exile for the past five years to avoid a prison sentence on a corruption conviction.